Boston University students, alumni, faculty, staff and social work experts came together Thursday night to discuss how to reform the healthcare system to fit social needs. The discussion was part of the School of Social Work’s speaker series. Jennifer Valenzuela, the program department principal at Health Leads, led the conversation. Madi Wachman, the program manager at the Center for Innovation in Social Work and Health in SSW, said before the discussion that the speaker series was created to bring together current students and alumni of the program. 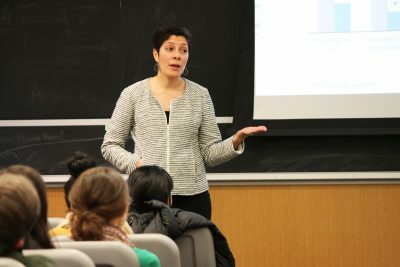 “We began the speaker series this semester and we are working with the Macro Student Committee at the School of Social Work to try and really bridge practice with academia, and give students and alums an opportunity to hear from people that are integrating social work and public health in the field,” Wachman said. Jason Stephany, a spokesperson for Health Leads, wrote in an email that Health Leads is a nonprofit organization that works with healthcare organizations to change what currently counts as healthcare to allow for various social needs. Valenzuela talked during the event about how Health Leads, like the speaker series, tries to give undergraduates the experience to work in the field earlier on in their career. Now, under a new president, Valenzuela said social workers everywhere need to reconsider how they do their practice. Several people who attended the discussion said Health Lead’s position was a unique yet helpful way of looking at social work in terms of healthcare. Laura McNulty, 30 from Somerville, is a prospective student at SSW and believes that thinking about healthcare in terms of social factors is an important topic to think about and incorporate now. “I think the topic of how social determinants of health, and work on them, can be incorporated directly into the healthcare system is pretty critical given the current time and what we know about social determinants of health in terms of their impact on health outcomes more generally,” McNulty said. Joanna Kreil, 36, of Melrose, said this discussion reminded her to only focus on what people need through the strengths of each program. Michèle Audet, 62, of Roslindale, said focusing on resources that work in the programs is what social workers should be doing.